Why is it that anglers find so much satisfaction through chance encounters? Think about it. You finally catch the fish you have literally dreamed about… cast at… or perhaps even just found yourself lucky enough to bring to hand after a weird alignment of the cosmos. After which, the ultimate expression of affection is to slide that fish back into the current. Even if, in your soul, you don’t know how that fish will ultimately fare days or weeks in the future. Even if you wish you might hold it forever. And even if you have no reasonable hope or expectation to experience that encounter again. That’s never easy. I vividly remember my own growing-up angling days in Michigan, when landing the big fish was only “validated” when I had it cleaned and splayed under plastic wrap in the refrigerator for those who would otherwise call my bluff. But there was one moment that changed all that. Grandfather woke me from my cabin bunk with a sharp bump on the bedpost with his rubber boot. It was Opening day. I had spent the night tossing oak logs on the cottage fire (every hour, on the hour) to keep him warm and comfortable. He was well into his 80s by then, but being at the Opening meant the world to him. He was too old to wade Michigan’s high spring waters himself at that point, but not too old to know where the fish were. So he drove me to the spot, in a wool robe with those rubber boots awkwardly (not gingerly) stamping the gas pedal of his Ford station wagon as we rumbled on sandy two-tracks through tunnels of red and white pines. He lurched to a halt, suggested a fly, pointed toward the run, and told me to get after it. Truth is, I’d fished that same run many times, on many previous Openings, to no avail. So on that particular morning, I had already conceded to go through the motions for the sake of tradition. But as the gray fog lifted, I peered into the tea-brown currents and saw a black shadow finning beneath the surface of the Baldwin River. I made one careful cast and surprised myself. My line went taut, then peeled upstream with angry purpose. 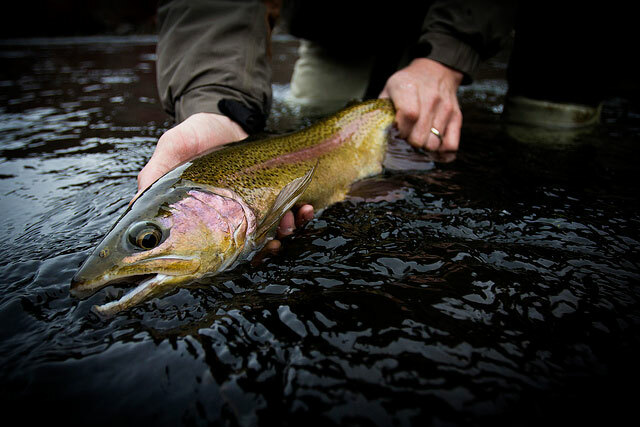 The hen steelhead quickly out-foxed me, plowing into a semi-submerged thicket. But I didn’t quit. I waded to the point where I felt cold water leaking down my chest… gathered line on the reel… grabbed the leader… slid my hands into the branches… and was eventually surprised to feel a silky, muscular body (instead of the snag I expected) at the end of my reach. I was barely able to wrap my icy fingers around her tail, pull her from the brush, and pop the fly from her jaw. Oh, how I wished I had a camera. Better yet, I wanted an audience. But she and I were alone. After I wriggled the fly free, I gave her a look in the eye, then ever-so-slightly opened my hand, and she swam upstream, burrowing right back into the brush. I never got another complete look at her, though I climbed up on the bank to watch for a good hour or so. I saw traces—a flick of the tail here and there. But she outlasted me. I went home to tell Grandfather about it. He believed every word. I figured none of the other fishermen in the nearby cabins would. So I didn’t bother telling them. Still, my mind was charged by that almost angelic encounter. I knew I had experienced beauty beyond anything I had ever imagined before. It literally changed my life. As such, I ultimately conceded that some fishing experiences—in fact, the best ones—are best kept as secrets, only to be replayed as memories. They’re ultimately measured in distance between the heart that loves and the one that swims away.